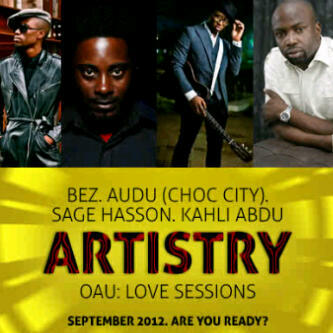 The second edition of the Artistry OAU series will hold on September 19, 2012 at the pit theatre, Obafemi Awolowo University. Gate Fee is just 500naira. It is organised by a group of students of the same university (ArtistryOAU). The artistry group is pasionate about showcasing talented artists, especially in the area of Poetry, Prose, Spoken Word, Rap as well as Live Music. If the first edition, ArtistryOAU: Hope, is anything to go by, ArtistryOAU: Love Sessions is going to be another amazing event. This edition of Artistry is headlined by singer Bez, rapper Kahli Abdul, spoken word pioneer Sage Has.son, entertainment mogul Audu Maikori as well as budding artistes in the OAU community. Audu Maikori who is also a lawyer and creative industry consultant is the founder/ceo of Chocolate City entertainment which boasts of stellar names such as M.I and Ice Prince and has proven to be one of the biggest names in the nigerian music industry. The UNIJOS graduate is also a former Nigerian Idols judge. He formed Guild of artistes and poets (GAP) and He’s a director at the copyright society of nigeria. Bez, whose real names are Emmanuel Bezhiuwa Idakula, surprised a few industry watchers (who may have been sleeping on his music) by leading the nominations for the Hip Hop World Magazine “Headies” Awards with 7 nominations. His instrument of choice is the Guitar which he learnt to play at the age of nine. Bez music can be categorised as R&B, Soul as well as a bit of jazz with the african fusion. 2011’s “Supersun” was one of the best albums spurning hit songs such as “more you”, “super sun” and “that stupid song” . The convenant university graduate stands out for his style and his fresh sound is quite different from the “afro hip hop” that’s so popular in nigeria. The video for “That stupid song featuring praiz” was premiered on BET. Bez has also been profiled on MTV. Sage Has.son is a maverick and he wants to be africa’s spoken word gift to the world. The poet whose real name is Sammy Hasson is probably a spoken word pioneer in nigeria. The abuja based artiste’s debut album is titled the poet. He would like to be like FELA! But without the lifestyle. Personally, I have heard sage hasson on a couple of modenine songs and he stood out. I saw him at a live show last year, performing without shoes.. Amazing. Kahli Abdu hails from jos and he’s closely associated with the chocolate city artistes, M.I, Jesse Jagz and Ice Prince and he was featured on M.I’s two mixtapes and MI2. He has several mixtapes; The Grind Theory, Ministry of Corruption and Rebel Music (with kid konnect), he’s currently working on his debut album. He Has a band, the rebel government and hereleases music every friday through what he calls rebel music fridays. 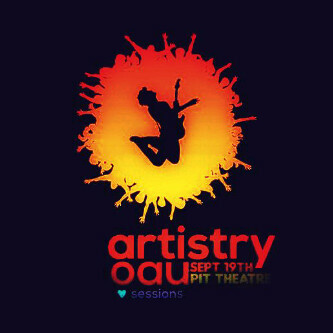 Artistry oau aims to promote and showcase all arts. They’re passionate about the arts and crave it. Music, poetry, prose, drama, designs, painting, they hope to showcase the creativity, inspiration & dexterity of the african youth.